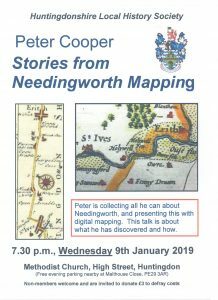 Our first meeting and lecture for 2019 is a talk by Peter Cooper on his work of researching the village of Needingworth. Peter is the recipient of a Goodliff Award in 2018 for this work. Come along to the Methodist Church, Huntingdon and hear all about how Peter researched and collected historical and geographical information about people, buildings, events, documents, etc., and presenting this cartographically with the application of digital technology. This is a new and innovative way of presenting valuable data about the life and makeup of village life. Join in with helping Peter update and enhance the information he has about this village and help him to build up his database for other villages and towns in Huntingdonshire. This entry was posted in Society Lecture on April 2, 2018 by David.